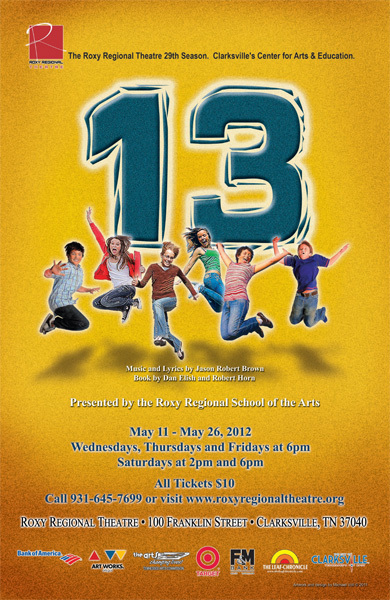 Clarksville, TN – Roxy Regional School of the Arts students explore the ups and downs of growing up in the high-energy musical “13,” opening Friday, May 11th, at 6:00pm in the Roxy’s TheOtherSpace. When his parents get divorced and he’s forced to move from New York to a small town in Indiana, thirteen-year-old Evan Goldman just wants to make friends and survive the school year. Easier said than done. With an unforgettable rock score from Tony Award-winning composer Jason Robert Brown, “13” is about discovering that cool is where you find it, and sometimes where you least expect it. Directed and choreographed by Tom Thayer, this hilarious, dynamic musical stars Truman Jepson as Evan Goldman and features Gavin Berlyak, Tiffany Bonds, Christian Boyd, Jesse Boyle, Addisyn Bryant, Hannah Collins, Tristan Fetter, Samantha Grimes, Patrick Long, Sidney McCarty, Hollie Morse, Lauren Mund, Madeline O’Connor, JC Poland, Liam Poland, Deanna Shenk and Amy Wyer. Presented in TheOtherSpace, the 50-seat black-box theatre located upstairs at the Roxy, “13” runs May 11th through May 26th, playing Wednesdays, Thursdays and Fridays at 6:00pm and Saturdays at 2:00pm and 6:00pm. 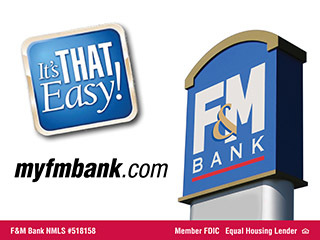 All tickets are $10.00 and may be purchased online at www.roxyregionaltheatre.org, by phone at 931.645.7699, or at the theatre during regular box office hours (9:00am to 2:00pm, Monday through Friday).